Annually around the second week of January onwards, our tropical climate will be so hot, dry and stuffy with much less rainfall or none at all for days on end. 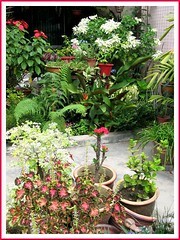 And, it is during such dry seasons that we’ve to be more diligent in watering our garden plants, especially so when most of our plants are in containers. No problem, as my better half is very regimented in carrying out his garden duties…but how about when we’re on vacation? Only the hardy and fittest will survive! Aaargh…we were away for just 3 days to Genting – City of Entertainment, to celebrate the Chinese Lunar New Year with our family and returned to a sorry sight of thirsting plants in baked soil. Thank God that the majority of our plants seemed okay, except for the potted Coleus, Blue Daze, False Heather and Bauhinia Kockiana, all shrivelled and drained of life. I quickly drenched all our plants with the garden hose the evening of our return, and was delighted to discover the next morning that all survived the scorching heat except for 2 pots of False Heather and Bauhinia Kockiana. 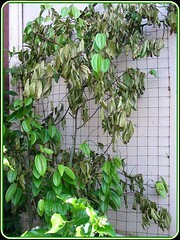 See this right image of Bauhinia Kockiana’s burnt leaves! I’ve now given it a severe haircut and we are hoping for the best…fingers crossed! Nevertheless, the rest of the garden plants continue to grow well in spite of the harsh weather, with our tender loving care. And, the most spectacular of all for the month of February, is the grounded Mussaenda philippica aurorae, as seen in the following images. What marvelous beauty! 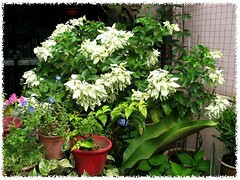 Its huge and gorgeous clusters of almost-white leaf-like bracts really brighten up the garden area. I’m truly glad that I’ve given this shrub a hard prune, right down to a foot tall from the base last June or probably July. It’s now about 5 feet tall, presenting a more bushy spread with more amazing white lovelies. A vigorous grower, it has outshined remarkably. A couple of feet away, is the potted bush of Mussaenda erythrophylla ‘Ashanti Blood’ and probably doing its best to compete with its white cousin. Needless to say, it can do that effortlessly as its strikingly beautiful and brilliant red bracts are truly a sight to behold – very captivating indeed!